Katie Holmes does it. So does Jessica Alba. Even Tiger Woods dabbled in it. So what exactly is the appeal of scuba diving? Well, it may seem like a fun vacation activity rather than a workout, but celebs LOVE that it allows them to burn calories while tightening and toning their bodies. Scared of being under 40 feet of water? You’re not alone! Sandra Bullock used scuba diving as a way to conquer her fears. 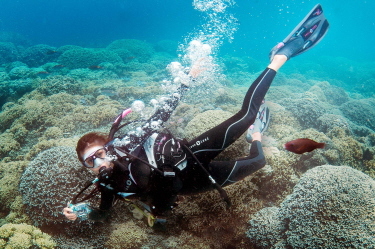 "When I get to the base [ocean floor] scuba diving I'm fine,” she explained. “It's when you are treading water and you don't know what's below. I love when you get to the peace of scuba diving." Kate Hudson also admits she overcame her fears of water for her role in Fools Gold. "It was pretty scary because at the time I was only just getting certified and behind me was a manta ray. And it's like the size of a dining table!" she said of her first shark encounter. "When I'd calmed down, I saw that sharks are graceful and the way they move is amazing." The Vampire Diaries star Nina Dobrev (pictured here) traveled to Bora Bora over the holidays to earn her PADI (Professional Association of Diving Instructors) Open Water Diver certification. Nina stayed at the Hilton Bora Bora Nui Resort & Spa and earned her certification at TOPDIVE-Bathys. During her vacation she had the opportunity to dive with sharks and said they were beautiful and peaceful to swim with. Dobrev even expressed her excitement to her fans via Twitter. She posted: "Beyond excited to share that I'm officially an Open Water PADI CERTIFIED DIVER!" You can view a photo of her certificate here. Not traveling to a tropical beach anytime soon? Don't worry. You can still get in on the trend. There are dive centers all across the nation with indoor lessons and courses. PADI (Professional Association of Diving Instructors), the world's largest recreational scuba diving organization, offers countless opportunities to stay active while experiencing new underwater adventures. With more than 6,000 dive center and resorts around the globe, one can literally learn to dive anywhere in the world. PADI's website is the ultimate online resource for people who are passionate about scuba diving and those seeking to learn more about it. The site provides valuable tools such as travel recommendations through the PADI Travel Network, dive center and resort locations, dive partners, current course offerings and eLearning for individuals seeking scheduling convenience and flexibility. Kari Friedlander serves as an online editor and publicist for In Touch Weekly magazine. A pop-culture pundit, Kari has a talent for providing an insider’s perspective on celebrity, from breaking news to breakups, and the latest hot spots where the trendsetters frequent. Her knack for exploration led to a job in British media in London for a summer and inspired her to circumnavigate the globe on a Semester at Sea voyage. Kari has written for InTouchWeekly.com, TVGuide.com and has interned at both People magazine and Teen Vogue. Kari writes our Lights, Camera, Travel column, sharing insight on how to jet set like all your favorite stars.